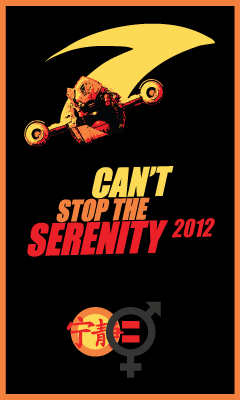 We'll have a table at the annual Can't Stop The Serenity charity screening on Sep. 30 at the Plaza Theatre on 1049 Ponce De Leon Ave., Atlanta, GA. 30306. This is run by the Atlanta Browncoats, and is to benefit Equality Now and the Atlanta Community Food Bank. We'll have some special Firefly magnets for sale, as well as other new stuff. Hope to see you there!